Agnieszka Godfrejów-Tarnogórska from Poland is a theologian and Press Officer of the Evangelical Church of the Augsburg Confession in Poland – a diaspora church with around 70,000 members. At their Church Synod in April 2016 the proposal to admit women to ordination narrowly failed to reach the required two-thirds majority. Frustrating, according to Agnieszka Godfrejów-Tarnogórska, although despite this she is still filled with hope, and she talked about the perspectives of women in her church. Agnieszka Godfrejów-Tarnogórska regards the idea that men and women are called to ministerial office as part of Reformation thinking. “Luther wrote: ‘therefore all Christians, men and women, are priests…’.” She said that in Poland the discussion about women’s ordination had been going on for more than 70 years. Since 1963 Polish women graduates in theology have been able to engage in teaching, to conduct worship and to provide pastoral care within local churches. A decision made in 1999 permits women to be ordained as deacons, which opens up to them the possibility of taking on other duties such as baptisms, weddings and funerals. But women are not allowed to be ordained as ministers, which means they cannot be the official leaders of a congregation. “So there are certainly women in leadership positions in our Church, for example as directors of diaconal social work”, she said. Polish women theologians are very active and share information in a “women’s bulletin” among other things, as well as publishing books. “We do have a voice”. And since the beginning of this year women deacons also have the right to distribute communion. “Things are improving,” said Agnieszka Godfrejów-Tarnogórska. However, the situation of women clergy in Latvia has not improved, but worsened. At its Synod meeting in June 2016 the Latvian Evangelical Lutheran Church (LELB) overturned the decision made in 1975 for the ordination of women. Dr Dace Balode, Professor of Theology and Dean of the Theological Faculty at the University of Riga, explained how it had been possible to take such a backward step in a country that is in fact going through a process of continuing development in terms of politics and democracy. The Church in Latvia has become increasingly conservative, under the influence of Archbishop Jānis Vanags and strict hierarchical thinking. “What the Archbishop says, goes, as if it came from God himself. You must be obedient to him”, said Dr Dace Balode. And this Archbishop had always spoken out against the ordination of women. “A lot has changed in our Church in the last twenty years. There was a deliberate effort made to promote the view that women could not be ministers”. Professor Balode found it problematical that there was no public debate on the topic of the ordination of women. As far as she could remember, the only time that it has officially been spoken about was at a preparatory conference for the Church Synod in 2014. A number of so-called evangelists – female clergy who do not have the same rights as male pastors - had been invited to the conference, though they were only allowed to listen and not to take part in the debate. These developments are also having an effect on training, noted Dr Balode. Above all there was a lack of money. The theological faculty where she teaches has been excluded by the Church because of its strong support for the ordination of women. Other academic institutions receive financial backing from the conservative “Missouri Synod”, the second largest American Lutheran Church in the USA. 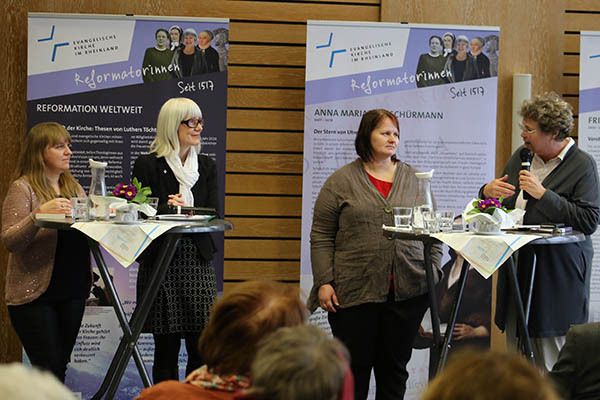 "Our own history in relation to women’s ordination is still quite recent"
Looking at the situation of women in the Rhineland Church Barbara Rudolph stated: “We find ourselves at a stage where there are still some things that could be improved, especially in relation to leadership. When it comes to having leadership responsibility outside the local congregation, there are fewer and fewer women.” For example in her own case, in the Federal Republic as a whole, at Regional Church level she is still the only woman in a leadership role today with responsibility for ecumenism.